Outside 60 days from Arrival - Full Refund less $200 cancellation fee. Inside 60 days from Arrival - No Refund. We suggest you have Travel Insurance for your holiday. 1/ DATE - The premises are let to you for holiday purposes only. 2/ ACCESS - The premises will be available after 3pm on the day of arrival and must be vacated by 10 am on the date of departure. 3/ CLEANLINESS - The Premises are to be left in the condition which they were found. A minimum additional cleaning fee of $100 will be charged for properties left in an unsatisfactory condition, and an additional $100 fee if any dishes, pots/pans, barbecues etc are not cleaned and/or have not been put away. Bicycles are not permitted inside premises or in "common areas" of apartments. Evidence of bikes being inside will attract a minimum extra cleaning fee of $300. Please keep bikes in garages (if provided) or in storage area. 4/ CLEANER - A cleaner will be allowed unobstructed access a minimum of once every 7 days. The cleaners will vacuum clear unused areas of carpet, mop clear unused floor space and wipe clear unused bench surfaces, mirrors, fridges and ovens. 5/ OVERCROWDING - The number of occupants must not exceed the amount on the occupancy certificate. Overcrowding of properties will result in the immediate termination of your stay and no refunds will be paid. Council’s objective is to ensure the safety of residents and tourists. Fire safety, health and amenity issues are a priority in the shire. On the spot fines ranging from $600 to $1,500 per person (per person being that number in excess of the DA approved allowance) can be imposed on tenants by Council under the Environmental Planning and Assessment Regulations 2000 (NSW) for breaching conditions of the development consent. If an excess number of guests have been using the property without the agents approval then $500 per guest per stay will become payable. 6/ PETS - Sorry - Pets are NOT permitted on the premises. 7/ LOST KEYS - Guests are responsible for safekeeping of accommodation keys. Duplicates are not always available. Guests who already occupy a premise, who require a key from the Agent or his representative after office hours will be charged a service fee of $50.00, payable to the staff providing the service. If keys are lost, locks must be changed and the guest will be responsible for reimbursement to the managing agent. 8/ DAMAGE CHARGES - All damage, breakage or losses to the property and/or furniture and furnishings will be charged to the guest. An inventory list is provided as a benefit to you. At the end of each stay and occasionally during mid stay cleans the contents are checked against the list. If for some reason you find something damaged or broken when you arrive at the premises please report it to our office immediately. 9/ NEIGHBOURS - No person on the premises shall be guilty of conduct that is a nuisance to the adjoining neighbouring occupiers. 10/ SALE- In the event of the property being offered for sale, the guest agrees to allow the owner or his agent to inspect the property with prospective purchasers during reasonable hours by appointment. 11/ PROBLEMS/MAINTENANCE - If you find a maintenance problem please advise us immediately. The guest agrees to allow the Agent or his nominee to enter accommodation to arrange necessary repairs. Please note that some maintenance problems may take time to be repaired. Jindabyne has limited access to trade and maintenance personnel. The agent cannot be held responsible if the problem can’t be fixed immediately. 12/ SMOKING - All Ray White Jindabyne properties are 100% NON SMOKING. Any guests that are found to be smoking or any evidence of this will incur at the minimum, an extra cleaning charge of $400. Smoking in smoke free apartments cause’s damage and this will be charged to the guest. 13/ BREACH - Any breach of the above conditions will result in the immediate termination of your stay. Any costs associated with any repair, excess cleaning or loss of income as a result of guest or guest visitor actions, negligence or misconduct will be recovered from the guest. 14/ CALL OUT FEES - Residential premises in the Snowy Mountains have standard hot water systems and electrical circuit boards. Hot water can run out quickly in this cold environment, and using too many electrical items, including heaters at the same time can trip an electrical circuit. If I request a call out to assess or fix any of these issues, I will accept the call out fee charge to my credit card/bond. Alternatively if the issue is the result of a faulty hot water system, short circuit or appliance then Ray White Jindabyne will request a fix as soon as possible. 15/ LIABILITY - I agree not to hold the booking agency, managing agent or property owner liable for any problems that may occur that are not within their direct control or jurisdiction. Ie; power shortages, council sewer main blockages, transport or access problems caused by extreme weather events, domestic waste removal, trespassing, noise etc. 16/ LATE DEPARTURE PENALTY - If premises are not vacated and the key(s) are not returned to Ray White Jindabyne by 10 am on the day of departure then an extra days rental will be charged. I understand that the removal of my possessions will be with due care and that no claim shall be made for accidental loss or damage. I understand I will be charged for any damage to the property. I acknowledge that there is no refund for early departures or cancelations once the holiday rental has been paid. 17/ AGE - To rent a property you must be over 18 years of age and have the authority to enter into this agreement. Proof of age and identification will be required on check-in. At least one occupant must be over 18 years of age to occupy any Ray White Jindabyne property. 18/ SECURITY BOND - An agent holding fee of $500 as a security deposit will be applied against my credit card (or $500 cash), to be released if and when the property has been inspected, and the release is approved by the Property Manager. I agree that I can be charged for any damages or missing items after departure, with the amount owing to be deducted from this security deposit. Excess damages will be invoiced to the guests named above and perused through all legal means. 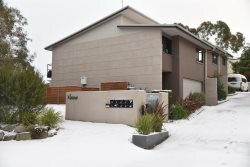 19/ RELEASE OF PAYMENT - Payments made by the renter to Snow Escape Holidays Pty Ltd t/as Ray White Jindabyne are to be released to the owner of the property and distributed in accordance with the agreement between the owner and Snow Escape Holidays Pty Ltd t/as Ray White Jindabyne. 20/ RIGHT TO CANCEL, ALTER or AMEND - Snow Escape Holidays Pty t/as Ray White Jindabyne reserve the right to cancel, alter or amend a reservation.